Dr. Avnish Jolly, Chnadigarh:Aanchal Bajwa D/o of Late Cmde HS Bajwa is a student of class XI, Yadavindra Public School, SAS Nagar Mohali was honored National Child Award for Exceptional Achievement 2006. She has awarded for the excellence shown in the field of academics, sports and co-curricular activities. 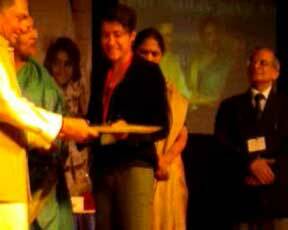 The award was presented to her by Renuka Chowdhry, Minister of State Women and Child Development and Janardan Dwivedi, MP(Rajya sabha) and chairman parliamentary standing committee on 14th November,2007 at Pragati maidan, New Delhi. The award carries a cash prize of Rs 10,000, a medal, certificate and a citation. Her record of achievements by any standard at such young age is commendable. A booklet containing details of the achievements of the awardees has been released by the minister. She is a perfect example of an all rounder. She has secured many trophies , gold silver and bronze medals , certificates of merit and appreciation etc. in field of Wushu (martial arts), swimming , athletics(track and hurdles), handball , yoga, mountaineering/trekking, cross country events etc. and in field of academics, dance, singing, arts , quiz, debates and dramatics. She has received a bronze medal form international award association, Edinburgh. She has participated in several internationals, national, all India public school, state, district, regional and inter school level competitions and has received many prizes. She has received a trophy for the best all round student of the year 2004-2005 and also received a trophy for the best all round student of the year 2005-2006. She also got a scholars tie and cash prize worth Rs 16,000 for scoring 85% and above for three consecutive years. She has been winning the best athlete trophy for four consecutive years in athletic meets held at Yadavindra Public School .This year she also received a trophy for being the overall best athlete among all age groups. Since three years she has been receiving a gold medal in the cross country races at her school and was awarded with the prestigious PT Usha trophy as well. The district too honored her for exceptional performance shown in swimming on 26 January,2008. The school has awarded her with school colours every year for showing excellent performance in sports like swimming, athletics, Wushu and circle kabaddi. Her other co-curricular activities include her participation as main lead in her annual school plays, participation in interschool fanta fiesta singing and dance competitions. Recently she appeared as the lead dancer in the video launched by Dr.Gurmel Chahal as an initiative to curb female foeticide. In all her collection includes 22 trophies, 110 gold, silver and bronze medals.